Quote Reply Topic: lizard ?? I have just seen a 5 inch creature that has a smooth skin texture black on the body top and orange under belly long tail and slow moving.Can anyone enlighten me thanks. 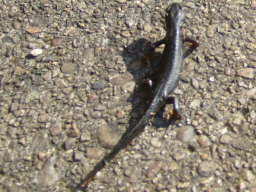 All I can say initially from both the photo and the description is that is a newt of some sort. Assuming it is native, given the size and colouration then, assuming it is native and not an escaped pet it is almost certainly a Great Crested newt. Do you have a larger photo by any chance? 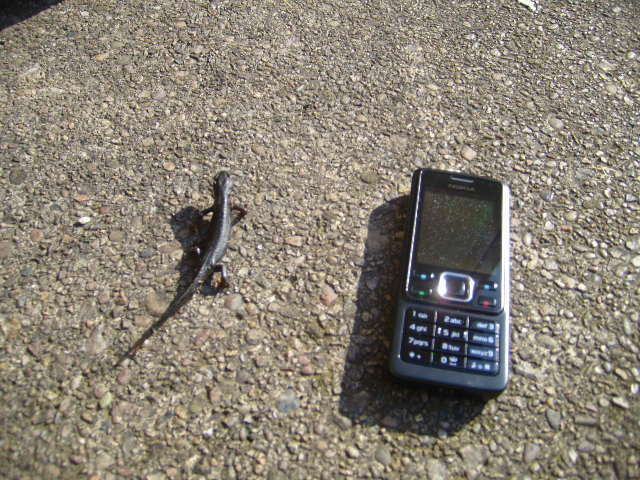 5 inches is a bit large for a smooth and it does look very dark so I would lean towards it being a GCN as Chris has said. I am not 100% certain though as the image doesn`t allow me to get a good idea of the skin texture which is slightly granular in the case of a GCN. Also the size of the tarmac particles in comparison to the animal suggest to me that it may possibly be slightly smaller? Say 4 inches? Another pic might help. You say that the belly was orange. Would you say that it was black with yellow/orange marbling or orange with darker spots? Hope this makes sense! Also, whereabouts in the country was the animal? I think Peter your right it's smaller. Flocol states 'smooth skin texture', 'orange under belly' my money would be on a male smooth newt, but not sure anyone could be certain from the picture. It`s certainly not the easiest image to put a confident ID to. I must admit my initial gut reaction (i.e. within the first second of looking at it) was male smooth before reading of the 5" approximation. However the more that you look at the image, the less sure that you are! I did think I could see feint stripes between the eyes above the snout area which would confirm the male smooth theory, but now I think I am seeing them because I want to! It looks a stocky beast, but it`s difficult to judge scale, and an imperial inch makes a big difference in this case. The skin does appear to be smooth rather than granular but it`s still not entirely discernible with the image provided. Yep, when I first saw it I thought cresty then I read the description and looked closer at the picture, it's the head that does it for me though and points to male smooth newt. I've seen them this dark before and almost black, so without a better picture that is what I would go for. Wow thanks for all of that now for the whole story.During February/March I was digging my back garden when I turned over this creature. Wow wonderfull thanks for all that now for the complete saga to date.I live in Derby 3 miles from the city centre on a large 1960 housing estate.Whilst digging my back garden in Febyuary/March I turned this creature over I had never seen any thing like it before.It was a sunny day it lay on my hand and did not move. 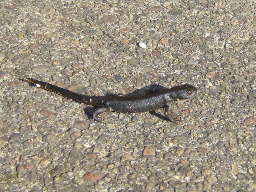 It was smooth skinned, black on its outer body and orange no spots or stripes on its under belly and 4 inches long amended from 5 inches.After 5 minutes the sun and my hand presumably warmed it and the black changed to dark olive green and mottled but still lethargic.Placing him under some grass I continued digging intending to photograph it later.The next morning armed with my camera alas it had gone.On the 11 June on the path in my front garden 50 yards from where I last saw it there it was.Although it was sunny and warm at 8 am it was smooth, black and still moving very slowly more photos are attached. I have since learnt that my next door but one neighbour has two pools in line with my front garden in the direction it was heading. Could this together with the other photos help you confirm its ID. Many thanks for your replies and involvement. Flocal any chance of putting that last photo up a bit larger?